Tragedy at Sea or the Barbarism of Profit? The Mediterranean is becoming one of the largest cemeteries in the world directly connected to the most squalid greed for profit. Every season, thousands of migrants die in the waters that separate the coast of Libya from Italy in a sort of tragic and repetitive voyage of no return. The latest tragedy has claimed the lives of 900 shipwrecked people packed like sardines in a tub of a boat that should have held a maximum of 200. A tragedy, just one of those things? No. Despite the ritual chorus of sympathy and the occasional disgusting hypocrisy, this has actually been taking place for years in the waters of the lower Mediterranean and it has only one cause – the drive for profit. It is for profit that Western imperialism has encouraged the fall of some regimes in the Middle East to get their hands on their oil revenue (e.g. in Libya France's Total in competition with the Italian ENI) or for strategic-geopolitical reasons (Syria, the clash between Russia and the US) that where there is possibility to realise profits in the future. The same goes for the initial support for the IS of the caliph al Baghdadi and his cutthroats by Saudi Arabia and the United States (against Iran and Russia). IS which a couple of years ago left the protection of its sponsors, is ravaging the area from Syria and Iraq to that of the former Libyan colonel, with dangerous ramifications throughout the Middle East. For this, and for this alone hundreds of thousands of desperate people are fleeing imperialist and civil wars, devastation and hunger as they embark from the coast of Libya in search of a life that is not possible within their own country. It is for pure profit that the barbaric people-traffickers, who turn desperate people into commodities and cram them, often as families, for one or two thousand euros each, for a journey that frequently ends up on the seabed. It’s always easy to make a profit once they are landed on the coast of Sicily, Calabria and Puglia. Thousands of these desperate people fall into the clutches of greedy local agricultural producers, who enslave them by working them for a season for two at three euros per hour for a whole day without even giving them anything to eat or a roof for the night. And it is for an even more horrible profit that some young teenagers are taken by trickery and a little money and thrown into the hands of paedophiles or become unwitting organ donors, enriching those surgeons who work on commission for a few rich and sick bourgeois in search a kidney or a liver transplant. And it is for that same old profit, although in this case already realised, that European countries are careful not intervene in order to save on costs. The most striking example is provided by the European Operation "Triton", which has replaced the Italian "Mare Nostrum" programme. Before Italy alone spent € 9 million per month, now with "Triton" Europe spends only €2.5 million. The patrols have been reduced in number as has the mileage and distance from the Italian coast. The barbarity of capitalism, with all the consequences of its devastating crisis, has brought us to this. There is no room for those who have lost everything, there is no money and what there is must be spent in other directions, so there is no political will for a significant intervention in this immense human tragedy. This dirty economic and social system operates only on the basis of cost-effectiveness. It looks for profit in factories by super-exploiting workers, then throws them on the streets when it no longer needs them. It pursues a strategy to acquire oil revenues by breeding an endless series of wars, we can well do without. Whether in the Parliaments of "civilised" bourgeois Europe or in the boats of "cutthroat barbarians" from the Middle East this trade between humans and their exploiters only gives off a nauseating smell of money and criminal business. All this we can not only do without, but have a political and moral duty to denounce and fight it until it no longer exists. On 14th June 2015 the latest edition of 'Paris Match' shows large photos of desperate people clinging to shipwreckd boats in the Mediterranean. 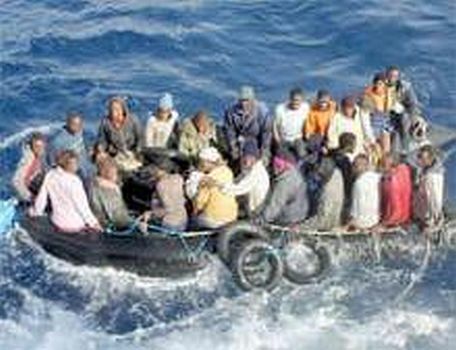 FD's aricle carries a photo such people aboard a ship heading for Europe and describes clearly the imperialist causes of their decisions to try to escape from mass poverty from whichever national area in which it prevails. FD ends his article by asserting that .."we have a political and moral duty to denounce and fight it until it no longer exists.". Attempting to see what that requires in materialist terms, rather than only understandable sympathies, it seems that economic power would be needed by the proletariat in Europe, which it does not yet possess, to 'come to the aid' of workers in North Africa, so at present that is not 'on the table'. Similarly, to argue that, at present,. workers in Europe without the means to provide homes and jobs and so on for what are going to be larger numbers of immigrants, should extend an open welcome, to as many as manage to cross the sea successfully, doesn't make sense for immigrants nor themselves, however much emotional empathy prevails. What could be done, maybe by combined operations of workers' organisations in Europe and Africa, is to state by leaflets and web that what would solve the problem would be for workers in Africa to take control of its vast resources and use them for their own benefit, rather than for that of plundering imperialism.